By-mail and PC on-demand video game rental service GameFly went through a round of layoffs today as part of a restructuring plan. 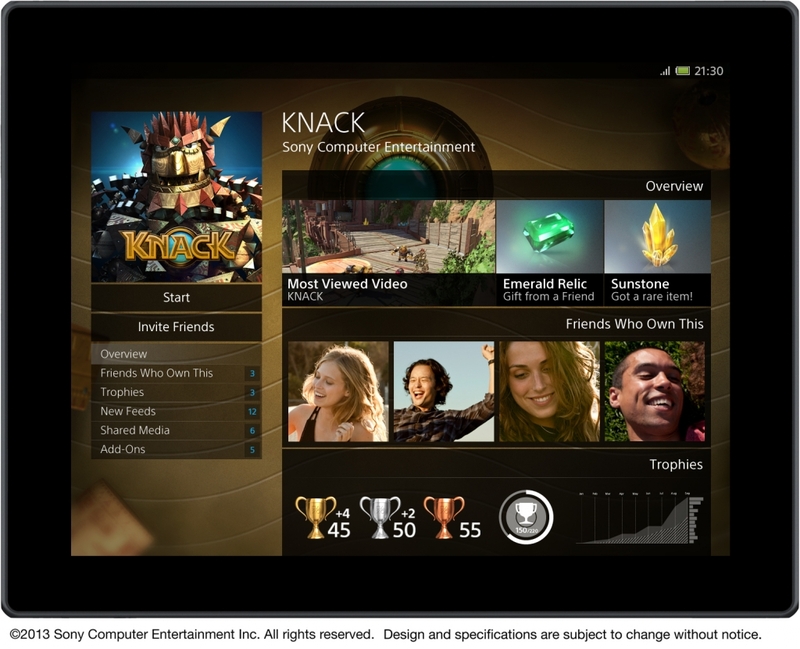 GameFly CEO Dave Hodess expressed the business is aligning itself better to existing console and digital games markets. "We studied our business and determined that we could operate with a smaller team while continuing to provide the same high level of service to our customers," said Hodess in a prepared statement provided to Joystiq. "Aside from a greater focus in our software development efforts, we're not making any significant changes in our console subscription or digital download businesses. GameFly remains profitable with a strong balance sheet." The company did not mention the extent of the layoffs, but sources tell us it was 35 employees in total, with another mentioning it was a third of the Los Angeles-based company's staff. Much like GameStop's used games business, a digitally distributed future of one-time-use watermarked games isn't likely to be kind to the by-mail rental service. The fact that GameFly also owns Direct2Drive (now GF Digital) may soften the blow. Update: "The layoffs represented approximately 15 percent of [GameFly] staff," a spokesperson for the company informs Joystiq. GameFly restructuring causes layoffs originally appeared on Joystiq on Thu, 28 Feb 2013 17:30:00 EST. Please see our terms for use of feeds. Here it is, the last day of February, and we were worried Army of Two: The Devil's Cartel would fall short in explosions for the month. This latest trailer not only exceeds February's quota for explosions, it has the added benefit of tipping the department over in tattooed guys with machetes too. 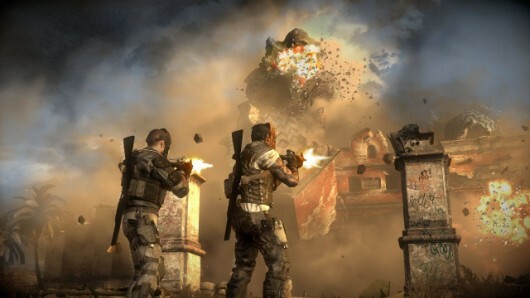 Army of Two: The Devil's Cartel exceeds monthly explosion quota originally appeared on Joystiq on Thu, 28 Feb 2013 16:00:00 EST. Please see our terms for use of feeds. Ubisoft Reflections - the UK studio responsible for Far Cry 3, Driver: San Francisco, Just Dance 3 and currently working on Watch Dogs - has a new managing director, Pauline Jacquey. Jacquey began working at Ubisoft in 1997, across studios in Paris, Shanghai, Montreal and Pune. She most recently managed Ubisoft Pune, in India, and transitioned the entire studio to a complete focus on digital games; while at Ubisoft, Jacquey supported casual and social game departments. 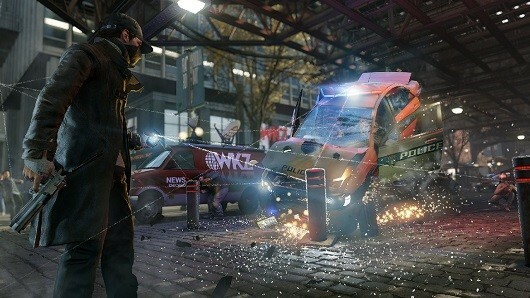 Ubisoft Reflections is collaborating with Montreal to develop Watch Dogs, confirmed for PC, PS3, Xbox 360, Wii U and PS4 so far. Reflections also has a "number of soon-to-be-announced projects," Ubisoft says. Ubisoft Reflections hires in-house social gaming veteran as MD originally appeared on Joystiq on Thu, 28 Feb 2013 15:30:00 EST. Please see our terms for use of feeds. Update: The live show is over, but you can watch the replay above. And wake up earlier, next time! The color for today's live episode of the Super Joystiq Podcast is "gunmetal gray." No one on the live show knows this, so they're probably wearing shirts in red, green and other garishly inappropriate colors, but with the games we're discussing today, they really should have known better. This week, we're talking about the slick silver stylings of Metal Gear Rising: Revengeance, the glossy metallic glare of Crysis 3 and Tomb Raider's subdued, twilight sheen. Truthfully, there probably won't be much discussion about actual colors during the show, but there is an undeniable trend here. Super Joystiq Podcast Live 040: Tomb Raider, Crysis 3, Revengeance [Watch the replay!] originally appeared on Joystiq on Thu, 28 Feb 2013 15:00:00 EST. Please see our terms for use of feeds. Want more Assassin's Creed? Tough, you're getting more, whether you like it or not. Ubisoft have confirmed the rumours that we reported on the other day - Assassin's Creed IV: Black Flag will be the next entry in the Assassin's Creed franchise. Box arts have been released for the Xbox 360, PlayStation 3, Wii U and PC. The PlayStation 3 version of Black Flag will also include an additional 60 minutes of 'exclusive' gameplay, although Ubisoft have yet to detail what form this additional content will take. Double Fine has self-published Costume Quest and Stacking on PC, but THQ still holds some of the rights to those games as publisher of the PS3 and Xbox 360 versions. Those games are among the properties being sold off in THQ's latest auction - however, they're being sold as a bundle with dozens of other properties. Officially, they can't be sold outside of the lot, but Double Fine is hopeful. "THQ retained limited distribution rights that we bid on during the previous process to reclaim them prior to their expiration," Justin Bailey, VP of business development, told Polygon. "We are optimistic about regaining these distribution rights, as this process has already demonstrated that when there are parties interested in specific assets, those assets are worth more when sold separately." Double Fine has yet to hear back from THQ about any potential deals. Double Fine trying to get Costume Quest, Stacking IP back from THQ originally appeared on Joystiq on Thu, 28 Feb 2013 14:30:00 EST. Please see our terms for use of feeds. 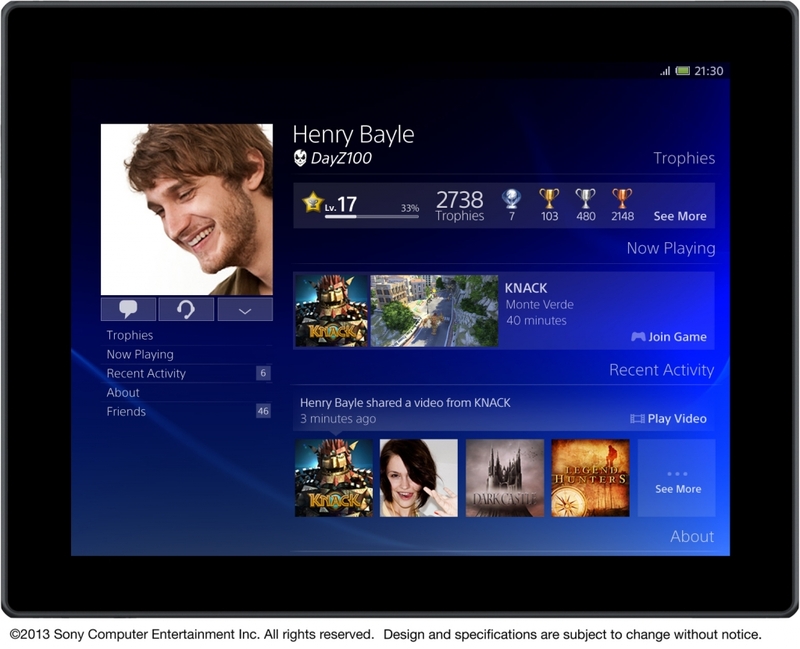 A number of user interface screenshots for the PlayStation 4 have surfaced. They demonstrate a number of the features that were discussed during the announcement presentation, including media sharing, live gameplay streaming, and the companion app for mobiles and tablets. It also looks like the trophies section for games will include more stats and charts for trophy hunters to admire. "Look at the games coming out on the PlayStation 3 this year like The Last of Us, Beyond: Two Souls, GT6." He mentions Gran Turismo 6 without any hesitation whatsoever as he lists off a number of first party exclusives headed to the console this year. It's a possibility that isn't as remote as it might first sound. Gran Turismo 6 has actually been in development since 2010, so a 2013 release isn't out of the question, despite the lack of information thus far released for the title. There are two games in the top 40 to be in their final week, Metro: Last Light for the PlayStation 3 and Xbox 360, and Etrian Odyssey IV (3DS). As a reminder the Pro data is back up, which means that I am taking requests again for games outside the top 20. Five games have 200,000 or more pre-orders, the same as last week, and the top 11 has 100,000 or more pre-orders, down from last week. Three games added 20,000 or more, up from two last week and six added 10,000 or more, down from seven last week. Metro: Last Light (X360) added 952 pre-orders for a grand total of 56,781. Expect first week sales in the USA at retail to be in the 75,000 to 100,000 unit range. Expect the game to sell between 250,000 and 50,000 units lifetime in the US. Metro: Last Light (PS3) added 454 pre-orders for a grand total of 37,795. Expect first week sales in the USA at retail to be in the 50,000 to 75,000 unit range. Expect the game to sell between 150,000 and 250,000 units lifetime in the US. Etrian Odyssey IV (PS3) added 3,208 pre-orders for a grand total of 35,313. Expect first week sales in the USA at retail to be in the 45,000 to 75,000 unit range. Expect the game to sell between 150,000 and 200,000 units lifetime in the US. Crysis 3 for the Xbox 360 is expects to drop to around 65,000 units in its second week on sale. The PlayStation 3 version is expected to drop to around 28,000 units. The PC version is expected to drop to around 15,000 units. Metal Gear Rising: Revengeance for the PlayStation 3 is expected to drop to around 60,000 units in its second week on sale. The Xbox 360 version is expected to drop to around 35,000 units sold. Overall hardware sales are expected to remain relatively flat week-on-week. 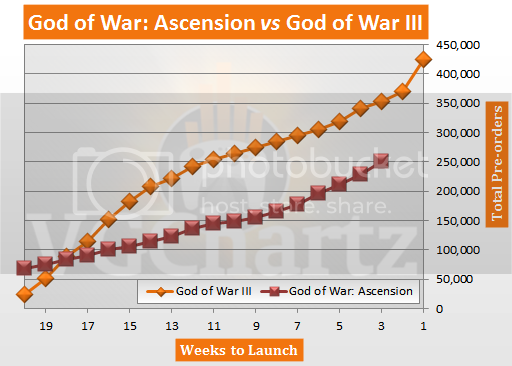 God of War: Ascension (PS3) added 20,705 pre-orders, up from 17,843 last week, for a total of 249,750. The game is 103,000 pre-orders behind God of War III. 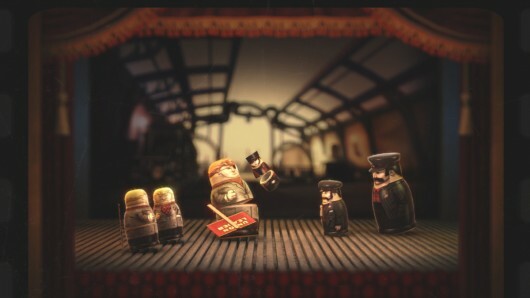 The game is three weeks away from launch in the USA, March 12, 2013. 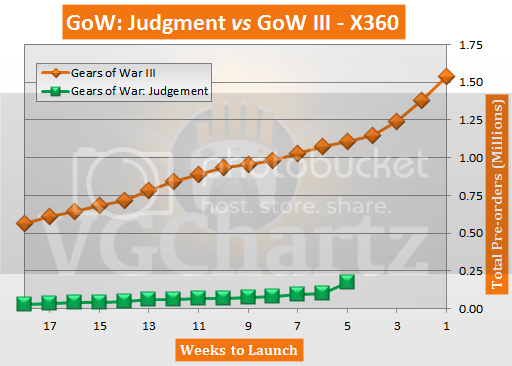 Gears of War: Judgment (X360) added 53,796 pre-orders, up from 16,295 last week, for a total of 172,132. The game has fallen 936,000 pre-orders behind Gears of War III. The game is four weeks away from launch in the USA, March 12, 2013. 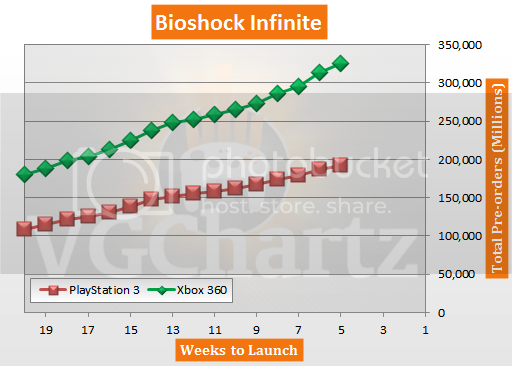 Bioshock Infinite (X360) added 11,859 pre-orders, down from 17,785 last week, for a total of 325,109. Bioshock Infinite (PS3) added 5,509 pre-orders, down from 7,796 last week, for a total of 192,333. The game is three weeks away from launch in the USA, March 26, 2013.
Notable mentions: StarCraft II: Heart of the Swarm (PC) added 14,075 pre-orders for a total of 235,841. The Last of Us (PS3) added 6,526 pre-orders for a total of 184,748. Tomb Raider (X360) added 10,025 pre-orders for a total of 107,846. Requests: Pokemon X / Y (3DS) added 4,372 pre-orders for a total of 21,009. Soul Sacrifice (PSV) added 1,814 pre-orders for a total of 7,905. Killzone: Mercenary (PSV) added 113 pre-orders for a total of 1,362. If your favorite game isn't in the top 40, leave a comment requesting which game you want to see and the most requested games will be added in next week's article!